During his 22-year career in the Navy, Art delaCruz was tasked with various assignments, including six combat deployments, commanding a Navy strike-fighter squadron, serving as a Topgun instructor, and serving as a Secretary of Defense Corporate Fellow at McKinsey & Co. Following his time in the Navy, he worked in Business Development and Strategy & Planning for the aerospace and defense sector. He now works with Team Rubicon, a team of veterans and first responders with a mission to “rapidly deploy emergency response teams” wherever they are needed. Art delaCruz explains how to lead and inspire others through a ruthless dedication to excellence. 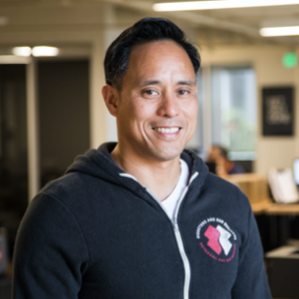 Art delaCruz is the Chief Operating Officer for Team Rubicon, the only non-profit disaster response organization that utilizes the skills of military veterans to rapidly deploy emergency response teams. In giving veterans an opportunity to continue their service, Team Rubicon provides them with a sense of purpose, community and identity. Since the organization’s founding in 2010 following the massive Haiti earthquake, Team Rubicon has responded to over 220 disasters and grown from eight to over 71,000 volunteer members. Team Rubicon has responded following Hurricane Sandy; the tornado in Moore, Oklahoma; Typhoon Haiyan in the Philippines; wildfire in Pateros, Washington; the 2015 earthquakes in Nepal, the 2016 flood in Louisiana and Hurricane Matthew, and most recently to Hurricanes Harvey and Irma. A retired U.S. Naval Officer, Art served as Director of Strategic Planning at Northrop Grumman Aerospace Systems prior to Team Rubicon. He was responsible for coordinating sector strategy development; developing and analyzing strategic growth initiatives; and overseeing the long range strategic planning process. Art served in the U.S. Navy for 22 years with notable tours including serving as an instructor at the Navy Fighter Weapons School (Topgun) and as the Commanding Officer of Strike Fighter Squadron TWO TWO (VFA-22). During his career, he made six deployments as an F-14 and F/A- 18 Naval Flight Officer. In 2010, he was one of 12 senior Department of Defense (DoD) officers selected as a Secretary of Defense Corporate Fellow, a program that places officers in leading companies to glean best practices that may be applicable in DoD. In this capacity, he was trained by and served with McKinsey & Co. In his final military assignment, Art served as the Deputy of Strategic Policy, and as Systems Innovation Lead at the U.S. Special Operations Command. Art earned his Bachelor’s degree in physics from the US Naval Academy and a Master’s degree in operations management from the University of Arkansas.